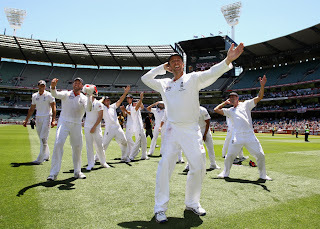 On a fine day at Melbourne, everything looked English, as England crushed Australia to retain Ashes, crumbling Australia to an innings and 157 runs defeat .Things could not look more ugly for Australia, who had dominated cricket for such a long time, tattered in the most un-desirable way. Now England ending year with Ashes win, would cherish all the memories and achievements they have attained this year, and would enjoy the most satisfying New Year eve. With things already looking gloomy for Australia a day earlier, as they already were on 169-6, they were never in a chance to challenge Strauss and the company. All they could pray for was if nature would work their way, but unfortunately it was not Perth. After resuming their innings, Australia first wicket was lost at 172 when Mitchell Johnsonn fell to Tremlett. After that they had some session of their own, with Siddle and Haddin built up a partnership teasing the English bowlers with a 86 runs partnership. Finally Siddle was dismissed at 40 off the bowling of Swann. Hilfenhaus the next batsman to come was quick to ease up England, went for a nought, and Ryan Harris who had suffered injury yesterday was absent hurt. Jonathan Trott was named man of the match for his century, which dominated Australia for almost two days. Now after such a fine performance by England, all Andy Flower and Andrew Strauss would plan for Sydney be that Australia do not level with them , and end with a series win as well. They at this time would not like to be complacent at all, and would carry on their amazing run. Under Andrew Strauss they became the first team in 24 years to retained Ashes down under, with even these credentials Strauss aims even higher and would keep on striving for the betterment of his team. "While you are still involved with England side, if you are not looking to push forward then there is something wrong there." , Strauss expressing his enthusiasm. With this embarrasing defeat, Australia especially Ricky Ponting would be thrown into deep chasm and would be under heavy artillery. Redeeming after such low, it will never be the easy for them. Ricky Ponting who led Australia to two world cup victories and, remained the leader of the World Number one team for a long time would need to re-think his strategies, and also need to revive his batting in order to inspire his team.